Get your game face on you guys, have I got a treat for you! This Hormel chili dip is going to blow your mind! Hormel chili, layered with cream cheese, and topped with melted cheese. Grab those salty corn or tortilla chips and dive in. This chili dip recipe is the perfect game day appetizer to serve up a crowd. 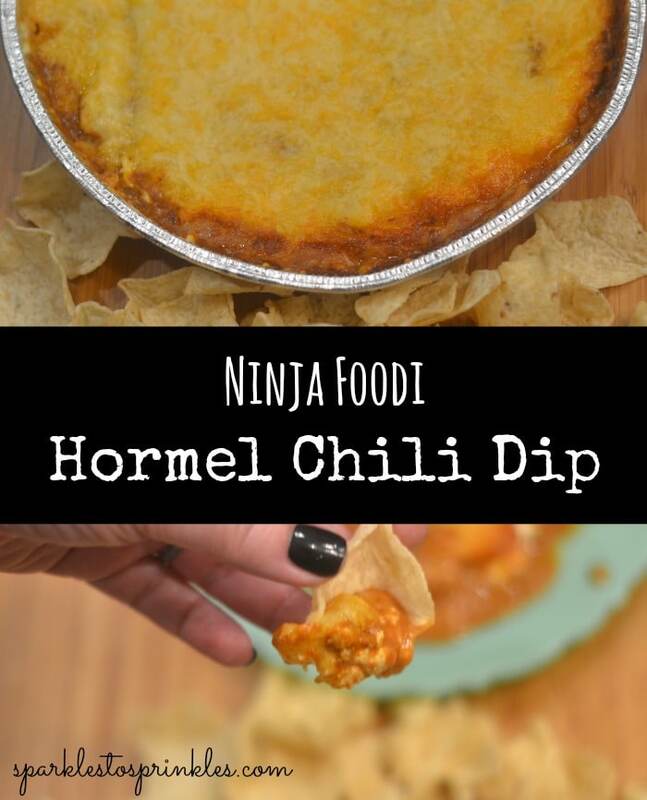 This Ninja Foodi Hormel Chili Dip is one of my favorite game day dips. It is so delicious I can not eat enough of it. I love dip!! It is definitely my favorite on game day and Hormel Chili Dip has always been one of my favorites. There are a few versions of this delicious chili dip and this one has a delicious creamy layer of cream cheese. Traditionally this dip is baked in the oven. I have been having such a love affair with my Ninja Foodi, I knew it would come out delicious and I had to find out. My hunch was correct and this Ninja Foodi Hormel Chili Dip is so delicious, I could not be more excited. Having a game day celebration? Make sure you also check out these delicious Ninja Foodi Crispy Buffalo Wings and my delicious Ninja Foodi Garlic Fries. Simple! My recipe is easy-peasy and the end result is addictive. Spread a layer of cream cheese in the bottom of the pan, top with Hormel chili, and top with cheese. Then toss in your Ninja Foodi and cook it up until the cheese is nice and melted! While this recipe is so simple to make, I guarantee you won’t have leftovers once you pull it out to serve. Let me even take it a step farther to blow your mind. This makes a crazy good topping for chili dogs. Just warm up your hot dogs, toss in a bun and slather on some dip, for the ultimate chili dog experience! I skip the Velveeta and reach for shredded cheese and cream cheese for my recipe. 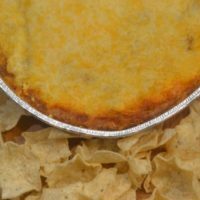 I have found it tastes so much better using a shredded cheese for a topper, and the cream cheese adds the perfect layer of creaminess to the dip. So if you want a no Velvetta chili dip, this recipe fits the bill. 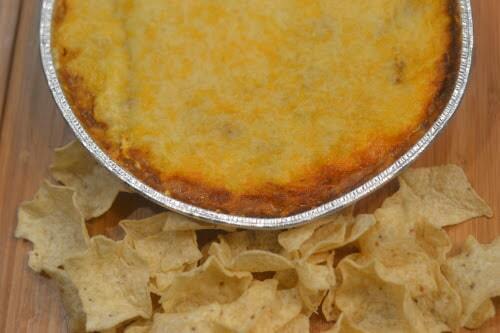 Not much is needed for this Ninja Foodi Chili Dip recipe! Just a little bit of time for prepping and the wait time of cooking before you can serve up a gold winner recipe. Give it a try and let me know what you guys think. If you don’t have a Ninja Foodi reach for your Air Fryer, it will work as well! The delicious classic Hormel Chili Dip made in your Ninja Foodi. This is the only way I will bake mine for now on. Delicious!! Place room temperature cream cheese into a 9" pie tin. Spread cream cheese to cover bottom completely. Next pour the Hormel chili on top of the cream cheese. Than spread the shredded cheese on top. Open the lid around 10 minutes to check the progress. 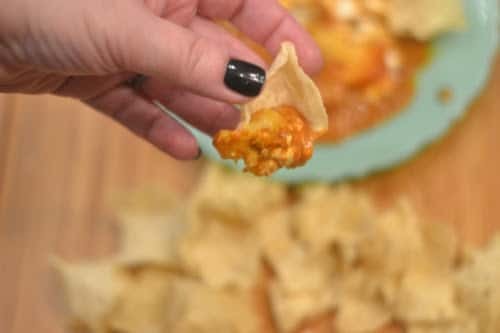 Serve with Nacho Chips & Enjoy!